• Minimum 5 night booking applies for first 3 weeks of Summer school holidays. Minimum tariffs apply for long weekends. * Reduced rates may be available for bookings 1 week or longer. Bookings are available after Easter for up to 2 months with a sliding fee scale depending on duration of stay. Download our location map in Adobe Reader format. If you don't have Adobe Reader you can download it from here. 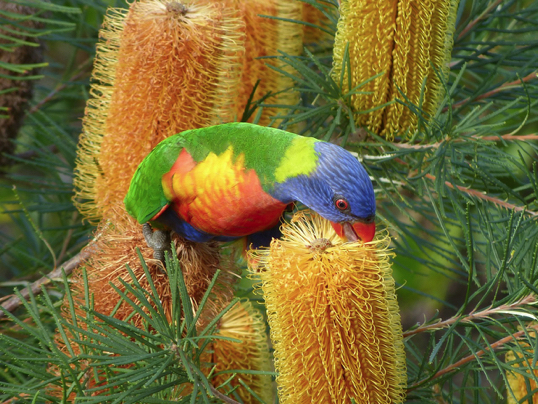 All our houses are located on large urban lots and have native bush gardens to attract local wildlife. This means native birds, kangaroos, possums, frogs, insects and spiders will be present at various times on the property. Please keep doors closed when possums are present and do not feed them or other animals. We do not use toxic chemical sprays and our cleaning products are naturally based. ur two waterfront road properties overlook the beautiful waterway of St Georges Basin. Less than 10 minutes drive from all properties will get you to the clean white beaches of Jervis Bay (Booderee). Jervis Bay provides superb snorkelling and scuba-diving in the abundant sheltered bays,and amongst rocky submerged outcrops. 1 x Yellow Cottage has 2 bedrooms and can sleep up to 5 people. 1 x Large house (Disabled-Friendly) which can accommodate up to 10 people. They are on large blocks with native trees and shrubs to attract local birds, plenty of space for vehicles and are a great holiday houses for families. The larger house is suited to large groups. Couples will find our small cottage quiet & peaceful and well suited to just relaxing or as a base for exploring the Jervis Bay region. Both properties offer value for money and provide the original South Coast holiday experience you may remember from childhood. The weather here is great for swimming from October to April, and the beaches & bush are beautiful in the cooler months. The Yellow Cottage is dog friendly; and clean well behaved dogs are permitted inside, but not on furniture or carpeted areas. 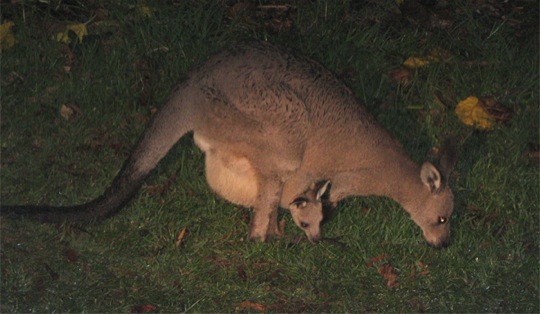 Picture below is of a mother kangaroo with joey taken at night in the front yard of cottage #87. Our cottages are located a short walk away from Grevilles Corner Store, which provides FREE Internet and Wireless access for visitors (WiFi). 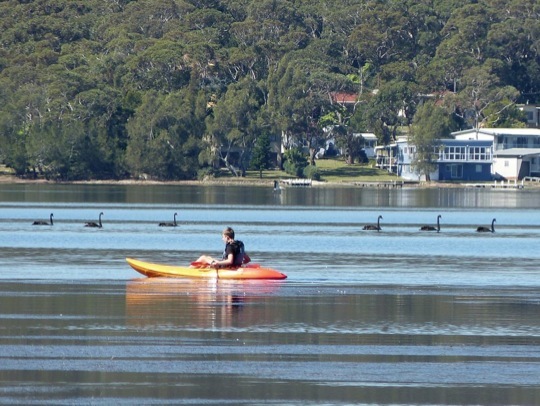 All cottages are within 1 km from a boat launching ramp. * Our houses are not suited to loud parties, as they are in a residential suburban area. Excessive noise or disruptive behaviour is not permitted at any time. Smoking is PROHIBITED inside our properties, and on the balconies.